Once a season or so, the MCO performs with a local choir, and the concert is invariably one of the season’s most popular. In 2019, the MCO has a particularly ambitious take on this tradition. We’ll be collaborating with Canzona, one of Canada’s top baroque choirs, to perform Handel’s epic Israel in Egypt. Nearly 30 years have passed since legendary conductor Henry Engbrecht led Canzona through their first season. After a short pause from performing a couple years ago, Canzona has resumed their place as one of the city’s best-loved choirs under the baton of the accomplished Kathleen Allan. Canzona displays a stunning command of the masterworks of the Baroque, but they also delight in introducing Winnipeg audiences to the rarely performed pieces and composers of the repertoire. We’ve split the difference at this concert: alongside the MCO, they perform one of the most rarely seen, and imaginative, works in Handel’s otherwise unavoidable oratorio repertoire. The epic nature of Israel in Egypt, fit for a Hollywood blockbuster, will be given its full due with a 28-voice strong choir and a mighty ensemble of the MCO that includes oboes, bassoons, trumpets, horn, timpani, organ, and harpsichord! With a masters in conducting from Yale, the recently appointed Artistic Director of Canzona is also a highly sought after composer and soprano. As a singer, she has appeared as a soloist with the National Broadcast Orchestra of Canada and the Vancouver Symphony Orchestra, while her compositions have been commissioned, performed and recorded by ensembles throughout the Americas and Europe. 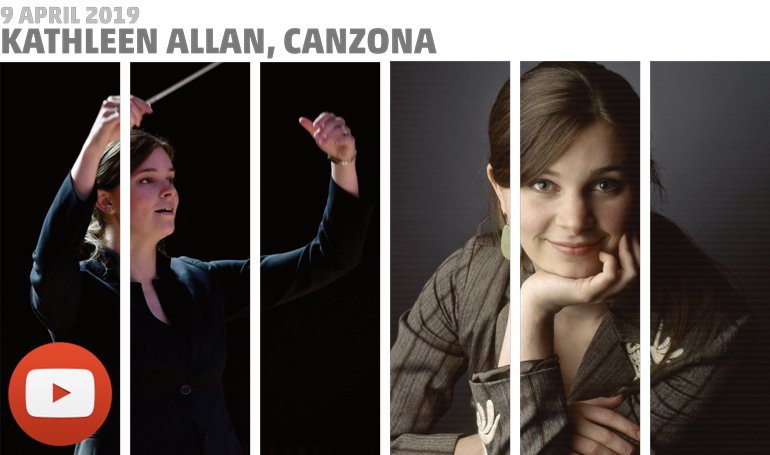 In addition to Allan’s intensive gig with Canzona, she somehow also finds time to act as Director of Choral Studies and Associate Conductor of the Symphony Orchestra at the Vancouver Academy of Music. The concert begins at 7.30pm on April 9th at Westminster United Church, 745 Westminster at Maryland. Tickets, at $35 for adults, $33 for seniors and $15 for students and those under-30 (incl. GST), are available at McNally Robinson, Organic Planet (877 Westminster Ave), and on MCO’s Ticketline at 204-783-7377. Canzona is Manitoba’s premiere Baroque choral ensemble. A love of Baroque music prompted the choir into being in 1989 under the direction of Henry Engbrecht. With new Artistic Director, Kathleen Allan, Canzona continues to delve into Baroque masterworks and introduce Manitoba audiences to lesser-known Baroque composers. Kathleen Allan’s expertise ranges from medieval repertoire to contemporary works, and she is particularly interested in the intersections between music of diverse genres. In high demand as a conductor, composer, and soprano, Ms Allan is rapidly becoming internationally respected for her compelling musicianship and engaging performances. In 2015, she made her Asian debut conducting Handel’s Messiah and Bach’s Christmas Oratorio in Osaka and Tokyo, and in 2016 was the recipient of the Sir Ernest MacMillan Prize in Choral Conducting. She is the founding co-artistic director of Arkora, a chamber music collective dedicated to interdisciplinary performance. Ms Allan serves as the Director of Choral Studies and Associate Conductor of the Symphony Orchestra at the Vancouver Academy of Music, and is the Associate Conductor of the Vancouver Bach Choir. Having nurtured a passion for early music since childhood, Ms Allan has studied and performed with many of baroque music’s leading figures including Nikolaus Harnoncourt, Masaki Suzuki, Nicholas McGegan, Helmuth Rilling, and Simon Carrington. She holds a degree in composition from the University of British Columbia and a Master’s degree in conducting from Yale University. Her compositions have been commissioned, performed, and recorded by ensembles throughout the Americas and Europe and have been featured at two World Symposiums on Choral Music. She has also appeared as a soprano soloist with the National Broadcast Orchestra of Canada and Berkshire Choral Festival Choir, the Vancouver Symphony Orchestra, and the Vancouver Bach Choir. A passionate interpreter of new music, she has premiered over two dozen solo works for voice. In addition to freelancing regularly in Canada and the United States, she has sung as a member of the Vancouver Chamber Choir, the Vienna-based Arnold Schoenberg Choir, Skylark Vocal Ensemble in Atlanta, Clarion Choir in New York, and the Yale Schola Cantorum. During the second decade of the eighteenth century, Handel relocated from Italy to England, where he won his greatest fame and enjoyed his broadest influence. One of his reasons for moving there was the popularity of a type of music with which he was already quite familiar, and through which he had won great success: Italian‑style opera. Over the next 30 years, he devoted major portions of his creative energies to supplying English audiences with that type of piece. London’s music lovers received his operas enthusiastically, with Giulio Cesare in Egitto, Ariodante, and Serse proving especially popular. Listeners found his purely instrumental music, including various sorts of concertos, very much to their liking as well. As time passed, fashions in music changed. The English public grew tired of what they considered to be Italian opera’s absurd plots, posturing soloists, and ornate vocal style. Another reason for its decline stemmed from the steady stream of satiric assaults launched against it by such widely‑read wits as Jonathan Swift and Alexander Pope. To add further fuel to Italian opera’s funeral pyre, English music lovers sought to cast off continental influences in favour of entertainment with a uniquely local flavour. They found what they were looking for on several fronts. One was comic stage pieces based on the popular melodies of the day, such as The Beggar’s Opera (1728), but the most important new entertainment style was oratorio. It represented not only a change from opera, but also a chance for audiences to hear and relish presentations given in their own language—a powerful inducement to enjoyment on several levels. Handel, to his major financial distress, twigged to this trend only slowly. He had actually contributed to the decline of Italian opera by throwing together too many pieces too quickly, thus allowing the quality of his output to decline. Once he realized the quarter to which the musical wind had shifted, he began producing a most successful series of English‑language oratorios, including Esther, Deborah, Athalia, and Saul. They helped him regain his title as his adopted country’s favourite composer. In structural terms, opera and oratorio are virtually identical. They both involve casts of solo singers, a chorus, and an orchestra, performing a sequence of recitatives, arias, ensembles, choruses and instrumental interludes. But in oratorios there are no costumes, scenery, or props, and this type of piece is performed in concert halls and churches, rather than in opera houses. Another important difference lies in subject matter. Operas deal strictly with secular topics, while oratorios frequently treat sacred ones as well. Unusually, Handel seems not to have composed the oratorio Israel in Egypt on commission. One theory regarding its inspiration is that he created it as an act of thanks for his recovery from a paralytic stroke that he had suffered the year before. It originally consisted of three sections. At this performance you will hear the second and third of them. From 1 to 11 October 1738, Handel composed what became the original third section, a vast hymn of praise entitled Moses’ Song. For the first section (not included tonight), he turned to a sombre anthem, The Ways of Zion Do Mourn, which he had written in December, 1737, for the funeral of Queen Caroline, consort of England’s King George II. Not wishing so fine a work to disappear after just one performance, the ever-practical Handel revised it, gave it a new text, and rechristened it Lamentations of the Israelites for the Death of Joseph. Handel then composed the original second section, entitled Exodus. It describes the plagues that God set upon the Egyptians to induce them to set free their Israelite slaves, followed by the Israelites’ departure, the parting of the Red Sea, and the destruction of the pursuing Egyptian host. He completed the oratorio by 1 November 1738. The premiere took place at the Haymarket Theatre in London on 4 April 1739. Handel performed as soloist in one of his organ concertos as an interlude. The oratorio flopped badly, for two major reasons: firstly, it features the chorus nearly to the exclusion of solo singers, in marked contrast to the prevailing taste for individual vocal virtuosity. And secondly, the virtually unprecedented practice of presenting biblical text in a public entertainment offended many listeners. For the next performances—there were only four over the following year—Handel dropped the entire first section and added several solo arias to the remainder. It is this two-part form, Exodus, followed by Moses’ Song, that has come down to the present, although there have been performances and recordings of the three-section version. The changes that Handel made in the wake of the premiere were to no avail. In fact, Israel in Egypt won no great success during his lifetime. It had to wait until the nineteenth century to attain popularity, when the appearance of numerous amateur English choral societies—combined with their audiences’ taste for a grand style of both music and presentation—led to it being performed frequently, including the Handel Festivals held at the colossal Crystal Palace, London from the 1850s to the 1920s. For a time, it even rivaled Messiah for the number of performances in Britain. The text of the Exodus section was adapted from the Old Testament book of the same name, and from several of the Psalms of David. Moses’ Song sets words from Exodus. The compiler of the libretto is unknown. The most likely possibilities are Charles Jennens, who had worked with Handel quite recently on Saul, and would do so again with Messiah three years later; and/or Handel himself. Befitting the grandeur of its subject, Israel in Egypt is an epic work, massive in sound and scope. Handel exercised tremendous imagination and variety in the handling of the performing forces. He called upon the double chorus, which as mentioned carries by far the greatest degree of the vocal weight, for a vast array of techniques. They include recitative, arioso, declamation, coloratura and antiphonal effects, not to mention a range of emotions encompassing everything from tenderness and grief to jubilation. Handel based nearly half of the oratorio on previously existing music, not just his own (Dixit Dominus, The Lord is My Light, keyboard fugues, etc.) but by other composers as well (most prominently Alessandro Stradella, Dionigi Erba and Francesco Urio). Such borrowings were common practice during the Baroque era. Johann Sebastian Bach indulged in them on a regular basis, and Handel’s own music was frequently subjected to similar treatment. Israel in Egypt contains more such reworkings and elaborations than virtually any other Handel composition. Perhaps his densely packed composing schedule made this necessary. In any case, his transformations are regularly superior to the original materials, regardless of origin. Only purists need fret over their presence. Duplicating a practice that Handel himself followed in a 1756 revival of Israel in Egypt, tonight’s performance will begin with the overture to Solomon, his oratorio of 1748. Author William Yeoman described the high points of the plague sequence that forms the dramatic climax of the Exodus section of Israel in Egypt: “the swarming strings representing flies in He spake the word, and the furious brass and timpani in He gave them hailstones for rain … the turgid, creeping textures and harmonies of He sent a thick darkness over the land, and the violent orchestral blows in He smote all the first-born of Egypt.” Handel gave an aptly majestic treatment to the sequence that begins with the Hebrew exodus, continues with the pursuit by the Egyptian army and the parting of the Red Sea, and concludes with the drowning of the entire enemy host. This segment ends with a restrained but heartfelt chorus of praise. That restraint evaporates with the launching of the final section, Moses’ Song. The overwhelming impression is one of energy and joy. Handel leavened it with contrasting music of warmth and piety (The Lord is my strength and my song, soprano duet) and powerful declamation (The Lord is a man of war, duet for basses, with oboes and bassoons decorating the line; The people shall hear, and be afraid, chorus). The text of this section’s text offers additional detail on the events of the Red Sea episode.